A day in Thessaloniki, Greece is a great introduction to Greece’s Second City. Often overlooked by tourists for Athens and the islands, Thessaloniki has quietly been developing its own identity and with a massive young population, it is progressing nicely. 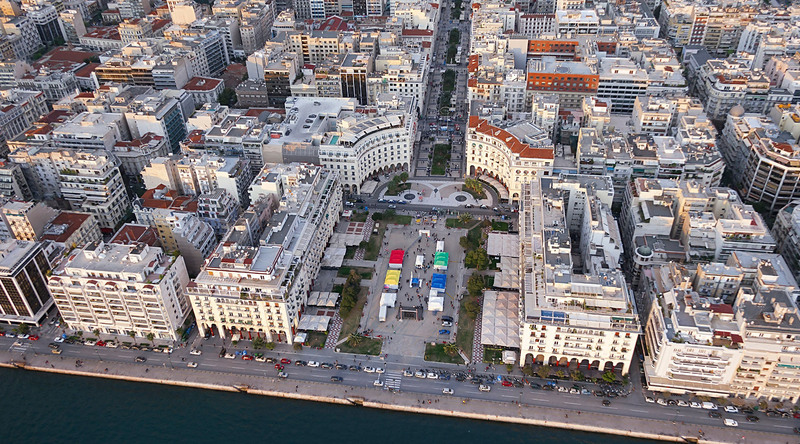 Lonely Planet named Thessaloniki as one of the top five party cities in the world. Walking around Thessaloniki, you get a sense of the energy and vibe of the city. It’s a really cool town. It’s not a beautiful place by any means but it has that cool Greenwich Village type edge to it and it’s a great place to stroll around. My day in Thessaloniki started at sunrise when the Azamara Quest pulled into port to a gorgeous sunrise. I had heard bad things about Thessaloniki beforehand. I had heard that it was pretty rundown and ugly and that it got really hammered by the recent economic downturn that crushed Greece. When you leave the port, it really isn’t that pretty but as you walk along more and head back into the windy back streets, you feel the vibe and see the incredible café culture. It reminded of Melbourne, Australia in that way. There are more cafes and bars in Thessaloniki than any city I can think of off the top of my head for a small city-even though a million people live in the metro area. Needless to say, it’s a great place for a coffee and of course a gyro…or two! The city looks very standard European on the surface but as you walk along more, it feels and looks a bit like Paris in some areas. There are some really cool looking apartment buildings in town. The other thing Thessaloniki has is a ton of little churches. I was really taken aback by how many small little churches there were seemingly built into residential buildings. This is in addition to some of the cool bigger churches and buildings they have around town. I loved the Rotunda in the center of town. Although the inside was under construction, it certainly looked cool from the outside. In town, there are old ruins and modern buildings side by side all over the place. As you move back toward the waterfront promenade, you will undoubtedly come across the White Tower. The White Tower is the most famous site in Thessaloniki. It’s nothing amazing but worth a look. From port you have to walk the whole waterfront to get there so you get to see quite a bit. You can go up for a small fee. I didn’t go as the line was too long. I really liked Thessaloniki and was pleasantly surprised. I feel like it’s the type of city that’s cool to live in or spend a week living in an apartment. However, a day in Thessaloniki is plenty to whet your appetite and give you a taste of what Thessaloniki is all about. I would definitely return.